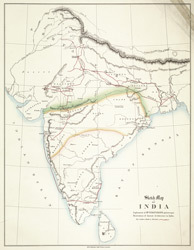 This map comes from James Fergusson's book 'Ancient Architecture in Hindoostan'. The red line indicates the route taken by Fergusson during his tour of India. He wrote: "The map appended to the work is merely meant to point out those places where the buildings are which are illustrated in the body of the work and also the principal divisions indicated in the Introduction ..."